Plants with a relatively extensive basal disc, consisting of confluent radiating cell rows, lateral cell fusions occurring at times. Erect filaments in clusters, short, usually not over 30 µm high, 7-10 µm in diameter, the cells about as long as broad. Tetrasporangia, the only known reproductive structures, terminal on the erect filaments, 17-20 µm x 15-17 µm, cruciately divided. 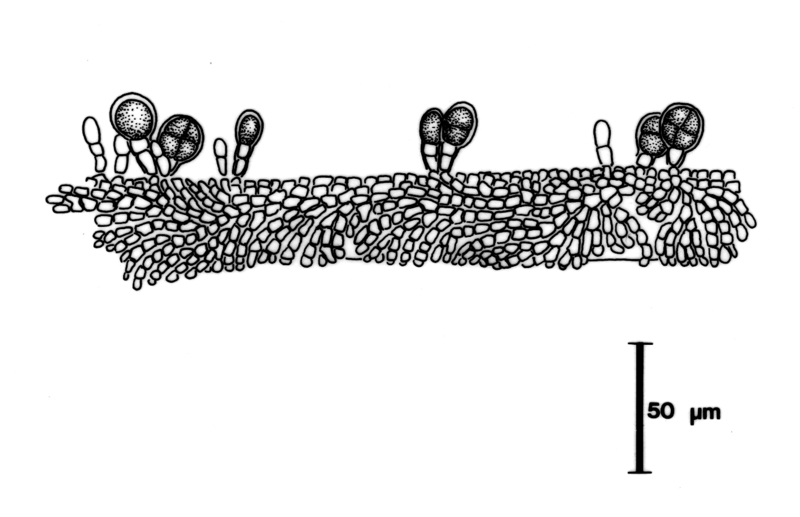 (As Audouinella concrescens in Stegenga et al. 1997). Known from sublittoral samples, on larger algae, west coast of Cape Peninsula to Tsitsikamma (16-32). World distribution: widespread in cold temperate seas (Stegenga et al. 1997). Type locality: Carmel Bay, California, USA (Guiry & Guiry 2015). Meiodiscus concrescens, habit of plant on Ballia sertularioides, with tetrasporangia. Reproduced from Stegenga et al. (1997) (as Audouinella concrescens). Gabrielson, P.W., Widdowson, T.B., Lindstrom, S.C., Hawkes, M.W. & Scagel, R.F. 2000. Keys to the benthic marine algae and seagrasses of British Columbia, Southeast Alaska, Washington and Oregon. Phycological Contribution from the Department of Botany, University of British Columbia. Vol. No. 5 pp. i-iv, 1-189. Guiry M. D. in Guiry, M.D. & Guiry, G.M. 2015. AlgaeBase. World-wide electronic publication, National University of Ireland, Galway. http://www.algaebase.org; searched on 14 May 2015.